Chris Wilder said that it was important for him to be part of this team as this is a way for him to give to others what he has received through football. He said that it was a big pleasure for him to play on the pitch and he hopes that his contribution will help many people. 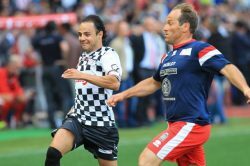 He said that there was a friendly atmosphere on the pitch and that everyone was enjoying themselves for a good cause. Concerning next season he said that he would be working on strengthening the team and he has already identified areas where the team will need new players. He said that he will be discussing with the chairman about potential new signings and that at the same time he does not want to disrupt the team spirit by bringing too many players. He said that he would be looking to promote some new players from the academy as well.